Running Time: 1 hr. 9 min. The antidote to this summer’s overcaffeinated kiddie cacophony turns out to be a return stroll through the Hundred Acre Wood. 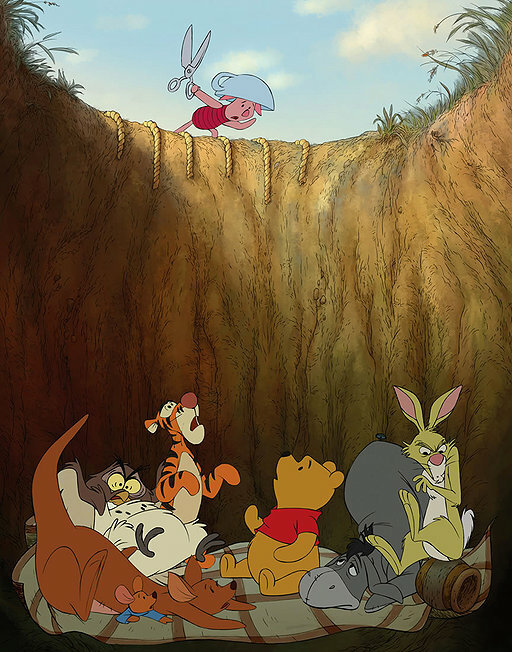 Although officially labeled a reboot, Winnie the Pooh is a nostalgic jaunt inspired by three of creator A.A. Milne’s original stories. The iconic woodland creatures frolic through the forest while searching for Eeyore’s missing tail, honey for the eternally famished Pooh, and a mythical, meddlesome monster called the “Backson.” A host of writers, including co-directors Stephen J. Anderson and Don Hall, keep matters both cuddly and clever, while the handsome visuals preserve the semblance of traditional hand-drawn animation. On the other hand, the insertion of several newly composed songs of uneven quality – including three warbled by Zooey Deschanel – nearly turns the film into a typical Disney musical. Fortunately, the filmmakers don’t dilute the distinct personality disorders: Pooh is an illiterate substance abuser, Tigger has ADHD, Eeyore is deeply depressed, Piglet suffers general anxiety, Owl is dyslexic, etc. It’s these traits that that continue to make Pooh and his pals lovable, flawed and accessible.